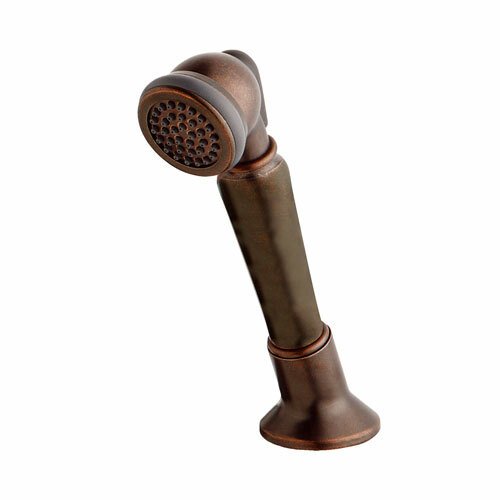 Danze Traditional Tumbled Bronze Roman Tub Filler Handheld Shower Add-on Kit: This Danze Roman Tub Handheld Shower Add-on Trim Kit is built to last. The highest quality standards are used to precision manufacturer a top of the line fixture. Important features of this 100% BRAND NEW Fixture: Complete Item! Everything necessary for installation is included. Tumbled Bronze Roman Tub Faucet Sprayer Kit - Trim Roman Tub Traditional personal spray kit - For those who want to get the most out of their Roman Tub, Danze has designed the traditional personal spray kit. This personal sprayer is complete with the Personal Shower with Soft Touch control feature for enhanced bathing. Available in multiple finishes that will compliment a variety of looks. - Personal shower with soft touch control for enhanced experience - Designed to work while button on handle is pressed - Tumbled Bronze premier finish designed to resist fading and tarnishing. - Brass construction will provide durability - Fits all Danze Brand Roman tub faucets with rough-in D210000BT or D215000BT - Matching Accessories Available - Easy to Install - Installation instructions included. This fixture is manufactured by Danze and is part of their Roman Tub Handheld Shower Add-on Trim Kit collection. For those who want to get the most out of their Roman Tub, Danze has designed the traditional personal spray kit. This personal sprayer is complete with the Personal Shower with Soft Touch control feature for enhanced bathing. Available in multiple finishes that will compliment a variety of looks.